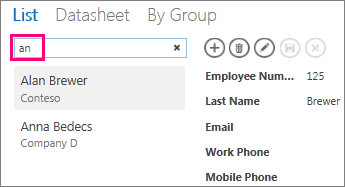 To see the data from your Access app in a form layout, use a List view (also known as a List Details view). When you add a new table to your app or import data into your app, Access automatically creates a List view for each table but you can create additional List views for your tables. The List view includes a built-in search box so it’s useful when you want to search or filter for specific data. The List view is also useful for viewing the details of a record, and adding, editing, or deleting records from a table. You select a record to view or edit in the List control on the left side of the List view. For more about adding tables to Access apps, see create an Access app. When Access creates a new List view, it automatically creates a control on the view for each field in the table. When you add a new field to the table, Access adds a new control for that field onto the List view as well. If you make any design changes to a List view, such as moving or resizing controls, and save your design changes, Access no longer adds new controls to the List view when you add new fields to the table. In this case, you'll need to add new controls to the List view when you add new fields to the table. Learn more about adding controls to a view. Click the table caption name in the Table Selector in the left pane and then click the Add New View button (the plus sign). In the Add New View dialog, enter a name for the view in the View Name box, set the View Type to List Details, and select the table name in the Record Source box. Click Home > Launch App to open the List view in the browser. 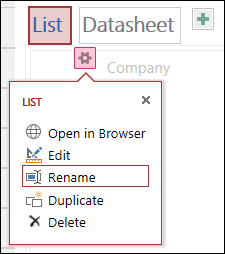 Click the table name > List to add, modify, or delete data in this view. To add a new record: Click the Add action button, type in the data, and then click the Save action button. To edit a record: Click the record from the list and then click the Edit action button. To delete a record: Click the record from the list and then click the Delete action button. To cancel any unsaved data modifications to a record: Click the Cancel action button. Here’s more on working with action buttons in an Access app. To return to the unfiltered view, click the “x” in the Search box. 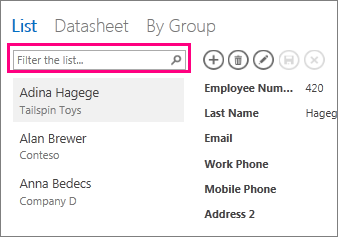 Here’s more on finding data in a List view. Tip: When you are viewing records in a List view, type the forward slash character / as a keyboard shortcut to move focus to the Search box. Click the table caption name in the Table Selector in the left pane and then click the List view. Click the property button and then click Delete. 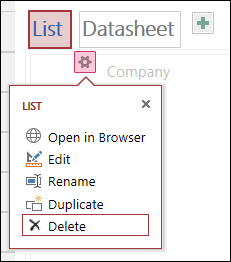 Click Yes to delete the List view or click No to cancel the delete. Note: Deleting a List view removes it from the list of views attached to the table and from the Navigation Pane. You can't undo deleting a List view. When you create a new table in an Access app, Access uses List as the view caption. This caption is not the actual name of the List view object shown in the Navigation Pane. You can change the caption of the List view to something more to your liking. Changing the caption of the List view does not change the name of the List view object shown in the Navigation Pane. Click the property button and then click Rename. Type the new List view caption name and then press Enter. Click Save on the Quick Access Toolbar to save your caption changes. Tip: To change the position of the List view at the top of the screen, click and hold the caption and drag it to the right or left to a new position. If you want to make an identical copy of a List view, you can use the Duplicate feature in Access apps. Click the property button and then click Duplicate. 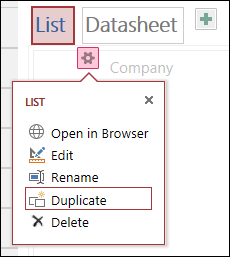 Type the name of the new copy of the List view in the Name of Duplicate box. Note that each view object in the Navigation Pane must be unique. Select a table to assign this to in the Location for Duplicate box. When you assign a copy of a view to a table, Access displays the view caption name when you click the table caption name in the left pane. Tip: If you don't want to assign a copy of the view to a specific table, you can select [Standalone/Popup] in the Location for Duplicate box. When you make a copy of the view as a standalone view, Access displays the object in the Navigation Pane but not in the list of views assigned to tables. To open standalone views in your browser, you must use the OpenPopup macro action. Click OK to create the new copy of the List view or click Cancel to cancel creating the copy of the List view. Click Save on the Quick Access Toolbar to save your changes to the list of views. Learn how to add controls to a view. Learn how to work with action buttons. 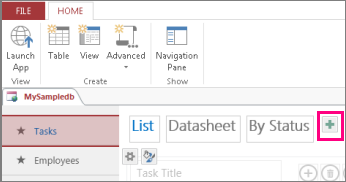 Learn how to customize a view by creating a user interface macro.